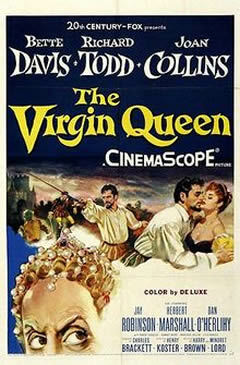 1955's The Virgin Queen was Bette Davis' 2nd go at portraying England's Queen Elizabeth I (following her turn in 1939's The Private Lives of Elizabeth and Essex), and from the looks of it, I'd say she had the role down pat. Walter Raleigh (Richard Todd) dreams of becoming a famous explorer, and during an audience with Queen Elizabeth I (Davis) talks of nothing but his intentions to sail to the New World. Impressed with Raleigh's enthusiasm, the Queen appoints him to an important position at court, much to the dismay of her chief adviser, Sir Christopher Hatton (Robert Douglas), who fears Raleigh may soon replace him as the Queen's favorite. Elizabeth has, indeed, developed feelings for Raleigh, and eventually agrees to outfit a ship for his proposed voyage to the Americas. But his future is threatened when he secretly marries Beth Throgmorton (Joan Collins), one of Elizabeth's ladies in waiting. If this secret is ever revealed, Raleigh will undoubtedly fall out of the Queen's favor. So far out, in fact, that it might even cost him his head. The opening scenes of The Virgin Queen feature Raleigh almost exclusively, and Todd delivers a solid performance as the opportunistic adventurer, even going so far as to show off his skills as a swordsman during a bar room tussle. Yet the film doesn't really come to life until Davis' Elizabeth I makes her grand entrance. At this point in history, Elizabeth was an older woman, and illness had caused her to lose her hair (Davis supposedly allowed makeup artist Pete Westmore to shave two inches off her hairline, which, she claims, never fully grew back). Yet while the Queen may no longer be as attractive as she once was, what she lacks in beauty, she more than makes up for in guile. While walking together during their initial meeting, Raleigh and the Queen come to a puddle in the road. Raleigh lays his expensive cloak across the puddle, so that the Queen can cross without getting wet. When he leaves the garment on the ground, Elizabeth asks why he didn't pick it up. His answer: he's not worthy to wear a garment her royal highness has tread upon. “Oh, pick it up”, she snaps back, somewhat annoyed by the obvious attempt at flattery, adding “I'm not yet sure whether you please me or not”. From that moment on, Raleigh is more direct in his dealings with the Queen, and his candor soon wins her over. Bette Davis is wonderful as the strong-willed Queen who can, at times, be downright unpredictable. When Raleigh first asks Elizabeth for a ship to sail to America, she responds by dousing him with a goblet of wine, causing the eager young man to storm off in anger. Yet, instead of banishing him from court, Elizabeth makes Raleigh the Commander of her Guard, convinced he's a man she can trust, and thus the perfect candidate for this important position. But as many have learned over the years, the Queen expects more than loyalty from her trusted subjects. At one point, Lord Leicester, played by Herbert Marshall, tries to warn Raleigh of Elizabeth's disposition, telling him “The Virgin Queen demands a devotion that is single-hearted, unwavering”. It's advice Raleigh ignores, and soon wishes he hadn't.